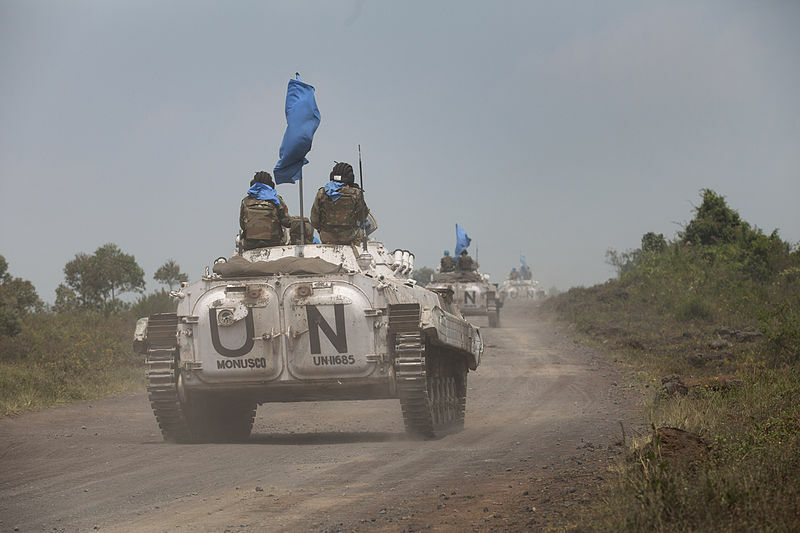 MONUSCO BMP armored vehicle patrolling near Goma. Photo by Sylvain Liechti. Next year marks the twentieth anniversary of the Kosovo conflict that was the genesis of the responsibility to protect (‘R2P’). This doctrine was developed precisely as an alternative to humanitarian intervention — the notion that unilateral force can be used to protect human rights in another state. The term was coined by a commission established by the Canadian government after controversial NATO airstrikes of the former Yugoslavia over its actions in the disputed province in 1999. Though humanitarian intervention was the most plausible legal justification for the airstrikes, the report avoided that language completely. The rhetorical shift was useful, moving debate away from whether ‘kind-hearted gunmen’ have a right to use force and onto how the causes that might inspire such uses of force can be prevented or handled more peacefully. In the event that prevention and peaceful means fail, R2P does allow for action by the UN Security Council under existing rules. But it neatly dodged the more difficult question — epitomized by the Kosovo case — of what rules should govern a humanitarian crisis when both the state in question and the Security Council are unwilling or unable to act. This paper first examines the legal framework of humanitarian intervention and how R2P came to be adopted and endorsed by UN member states in general and the Security Council in particular. The speed with which the language of R2P permeated the UN and the wider global system has been extraordinary, though this has been primarily in the nature of a political rather than legal transformation. A later section highlights the present challenges faced by R2P, evident in the partially successful operation in Libya and the dismally ineffective response to the ongoing crisis in Syria. A final section makes some tentative projections about the future — in which the language of R2P appears likely to continue its spread, but weariness of intervention on the part of Western states and the rise of Asian states defending a conservative notion of sovereignty will dampen the conversion of words to action. This is a draft of a chapter written for Robin Geiß & Nils Melzer (eds. ), The Oxford Handbook on the International Law of Global Security (Oxford University Press, forthcoming). It is available in full on SSRN here.